Catechumen Nick Lepiane signs the Book of Enrollment during the Rite of Election and Call to Continuing Conversion at Rochester’s Sacred Heart Cathedral March 5, 2017. On March 10, 7-year-old Teagan Matteson will be one step closer to becoming a member of the Catholic flock. On that day, she and more than 100 others will participate in the Diocese of Rochester’s Rite of Election and Call to Continuing Conversion, thus formalizing their intentions to become fully initiated Catholics. “I’m pretty excited,” Teagan told the Catholic Courier. During the ceremony, catechists from 40 parishes throughout the diocese will present to Bishop Salvatore R. Matano people from their parishes who for the past several months have been journeying through the Rite of Christian Initiation of Adults process. During the Rite of Election, the catechumens in the group — or those who are preparing for the sacraments of baptism, first Eucharist and confirmation — will sign the Book of Enrollment and become known as “the elect.” They will join the church during Easter Vigil services at their home parishes April 20. 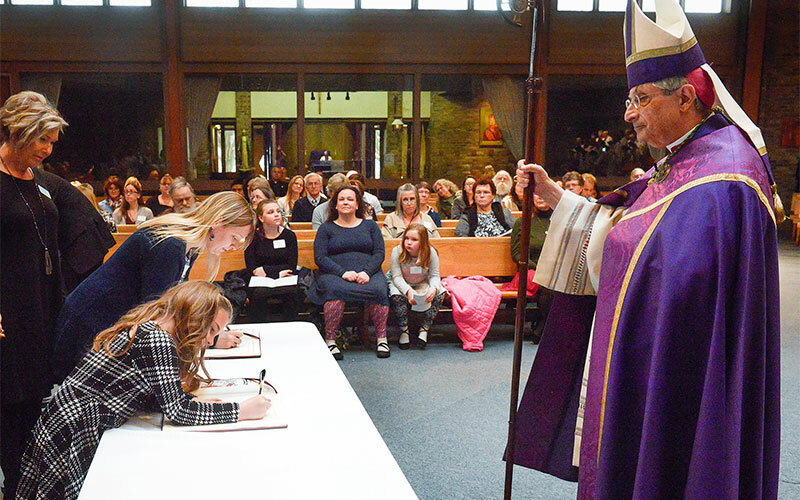 Ninety catechumens were signed up to participate in the Rite of Election as of press time Feb. 27, with several days remaining before the registration deadline, according to Don Smith, diocesan coordinator of sacramental catechesis and family life. The other 42 people signed up to participate in the ceremony are candidates who previously had been baptized in recognized Christian rites and will receive the sacraments of first Eucharist and confirmation during the Easter Vigil. Seventeen of the total 132 are under the age of 18. Bishop Matano will preside at two Rite of Election ceremonies, both on March 10. In previous years, one ceremony took place at Rochester’s Sacred Heart Cathedral on the first Sunday of Lent and another was celebrated at St. Mary Our Mother Church in Horseheads the following Sunday. “This year, in an attempt to unify the RCIA experience across the diocese, we are doing them both on one day. The Rite of Election and Call to Continuing Conversion is the one opportunity for adults to participate in a diocesan celebration with the bishop,” Smith remarked. This year the first March 10 ceremony will take place at 1 p.m. at St. Mary Our Mother and the second will be at 7 p.m. at Sacred Heart Cathedral. “Hosting both celebrations on the same Sunday allows catechumens and candidates from around the diocese to hear the same readings, experience the same rites and journey together, even if the rest of the journey is made at individual parishes,” Smith explained. Teagan is one of 10 people making that journey at Parish of the Most Holy Name of Jesus in Elmira. A catechumen, Teagan began the RCIA process at the behest of her grandmother, Harolyn Giordano, who received custody of Teagan and her 5-year-old brother, Lucas, after their parents were killed in a motorcycle accident last summer. The children’s parents, Harolyn and Matthew Matteson, were practicing Catholics, yet the children had not been baptized, Giordano said. After attending RCIA classes at Parish of the Most Holy Name of Jesus, the Mass has taken on a new meaning for them, she said. Teagan said learning about the saints has been one of her favorite parts of the process. She said she was excited to learn of the saint who shares her father’s name and already has decided to take the name Matthew at her confirmation. She is very excited about receiving holy Communion for the first time, and believes the RCIA process has strengthened her relationship with God. “It’s better now because I understand more,” she said.